Book Travel Ads in Indian Newspapers Instantly Online! Why Book Travel Ad in Newspapers? Travel classified text ads are simple run on line ads related to all sorts of touring or trip as well as legal formalities involved with travelling and lodging purposes. Text ads are concise and to-the-point that provide precise information and are charged on the basis of per 5 lines or characters used in the ad. Classified text travel ads related usually deal with new hotel launches, new holiday destinations, or promotion of holiday spots and guest houses etc. Though travelling is a category which always intrigues people it is important stand out rather just be lost in the crowd. Classified Display (CD) ads in the category of Travel are extremely prevalent, be it in a black and white or be it in a colored background. Display Classifieds in case of travel have many enhancements in black and white as well ad colored backgrounds. It is important to stand out in the race of millions in today’s competitive market, so make your Display Classified Travel ad stand out with some help from ReleaseMyAd. 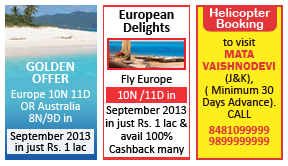 How to Book Travel Advertisement In Newspapers? Begin composing your newspaper ad online by selecting the Ad Type as Classified Text and move onto choosing your own category as Travel. You have the option of choosing from long list of sub categories in order to place your ad under the most specific heading to reach out to the most appropriate audience. Sub categories range from Bus Rentals, Hotel & Resorts to Travel Agencies and Visa or Passport Assistance. The next step of your ad booking process is to compose your ad on ReleaseMyAd’s ‘Compose Ad’ page. Type in your ad text and then enhance it with several background colors, ticks and other newspaper specific add-ons like underline or bold first line etc. Towards the end you are asked to choose the release dates of your ad and clear the payment after which you receive an email confirmation with all your booking details from our side. Start your newspaper CD ad booking process with selecting your ad type as Classified Display and manoeuvre to the page where you can select your ad category as travel. You can customize your ad any way you like and place your own personal sub category to differentiate your ad from the rest. Then go on to composing your ad with the help of ReleaseMyAd’s on site range of pre designed templates, available both in black & white as well as colored background. In case of Travel CD adverts the option to upload logos or images is not available but your ad can be designed with the help of text formatting, choosing catchy and contrasting background colors and having concise header and footer text. Make complete use of our exclusive Live Preview Ad Feature for a good look at how your ad will appear in the newspaper. At the end make sure that you have confirmed your ad release dates and cleared all your payments, in order to receive an invoice via email containing all your booking details from ReleaseMyAd’s end. Q. I want to book a display ad with O Herald o for my travel program. Require guidance how to do the same.